At PROFILTEK we work each day to make our dealers' work easier, assisting them in the sales process and providing them with the tools and services they need. We have our own transport fleet which ensures the fastest delivery times and arrival of product at destination in perfect condition. 1,000,000 km a year travelled by our transport fleet. All our dealers receive newsletters full of detailed information on what's new, opportunities, marketing activities, etc., which are of interest to them. And with a simple click, they can access documents, tools or promotional material from the Professional Area. This is an online space we are particularly proud of, because it supplies useful information in addition to giving them numerous applications and tools that are a great help for sales and after-sales, speeding up order processing and management. Want to join the PROFILTEK Professional Area? With almost 1,000,000 viewings annually, this is the perfect sales tool. The end customer can, in real time, personalize their enclosure by choosing the series, model, functionality, finishes, decoration, etc., and once they are satisfied with the result, our dealers pass on the order to our plant with a simple click. 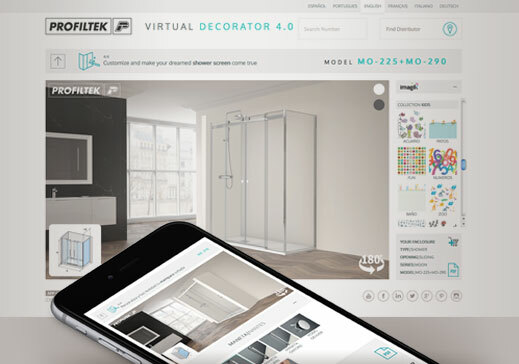 Install our new Virtual Decorator onto your mobile phone or tablet. Click on the button that is appropriate for your device’s operating system. In addition to our general catalogue, dealers also receive graphics material - posters, leaflets, PLV's etc. - that we develop for different campaigns throughout the year. And from the Professional Area, dealers can download all sorts of information and advertising material to boost their sales. For larger outlets, we also offer samples of finishes and different display systems. Our Technical Support Department solves any possible incident in the shortest possible time. What are you waiting for to become a PROFILTEK dealer?